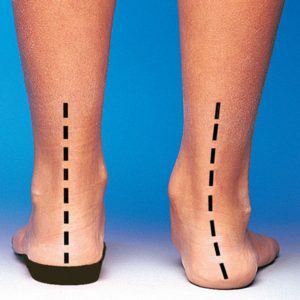 Orthotics work by correcting the structural alignment of the feet and legs. This reduces excess strain on particular structures (joints, ligaments, muscles) that may be causing you pain. Orthotic devices ensure that while you are standing, walking or running, the right muscles are being activated at the right time. This ensures you move efficiently, without overworking any part of the mechanical system. In this article, we will discuss the process of being prescribed orthotics and the importance of an orthotic review appointment. For information on the different types of orthotic devices we offer click here. A biomechanical assessment is a series of measurements, tests and observations that a podiatrist will conduct. We do this to gain an understanding of the way in which the bones, ligaments and muscles in your feet and legs interact while you are standing, walking or running. Initially, we need to understand what specific structures in the feet have pain. Once we know this, we can usually deduce which mechanical factors are contributing to the pain. After this, we can prescribe a treatment regime. Treatment may include: activity modification, stretches, strengthening, footwear advice, physical treatments or orthotics. Whether or not you need orthotics will be discussed. If pursued, measurements need to be taken with both your feet and shoes in mind. At the dispense appointment, the podiatrist will check the orthotics and show you how to employ the orthotics in your types of shoes. The wearing in process consists of wearing your orthotics for a couple of hours on the first day and then increasing this by a few hours each day. Essentially after ten days or so, you should be able to wear your orthotics for a whole day without discomfort. We don’t recommend you return for your review appointment until three weeks after your dispense appointment. This is because it takes approximately 10 days for your body to become accustomed to your new orthotics. Your feet and brain need this amount of time to get used to the new alignment before we seek your feedback on how your orthotics are feeling. The review appointment is important because, if your orthotics aren’t feeling just quite right, there are many adjustments we can make to rectify this. We also check in on how your symptoms are improving. Often, you won’t be entirely better by this time. We know how long various conditions take to resolve and the trajectory that your recovery should take. If you aren’t making the progress that we expect at this stage, we can implement some further or additional measures as required. At this appointment, the podiatrist will review your initial symptoms, review footwear and re assess your strength, flexibility and gait. Also, general wear and tear of your orthotic will be assessed as you may need new covering materials. Remembering to schedule an appointment in a year can be difficult. If it is convenient for you, we are able to send you a reminder SMS or letter. If you are overdue for your yearly review appointment, phone us 3256 1006 to make an appointment. When we don’t need to make any major changes to your current orthotics, second pairs are cheaper than initial pairs as we are able to use the same models. This may save you the hassle of swapping them between shoes. Alternatively, we may look to make a different sort of orthotic for a specific purpose. Orthotics for a women’s dress shoe do not translate well to use in running shoes and vice versa. It is possible to diversify your orthotic collection to allow you to have the perfect orthotic for each purpose over time. You can read more about the various types of orthotics here. You might like to use our online booking portal to schedule your next visit. Walk Without Pain!